Patrick Randolph helps small businesses get their products from the factory to customers' doorsteps. Bra gun holsters. Instructional painting DVDs. Bars of Turkish soap. All of these niche products are sold by small businesses from around the world -- but they are all shipped out of one New York warehouse. 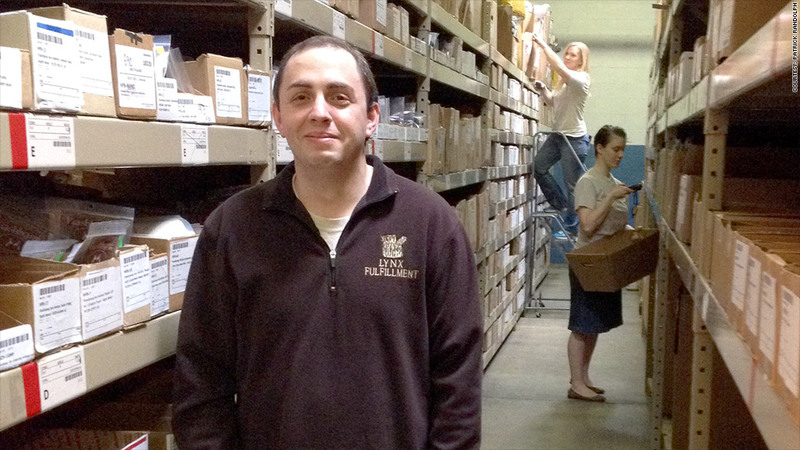 When large retailers fulfill orders, they often pull the items from their own warehouse, pack them and send them out. But for some small businesses, they have to outsource this part of the process -- known as order fulfillment -- to people like Patrick Randolph. From a 34,000-square-foot warehouse in western New York state, Randolph's Lynx Fulfillment ships up to 2,000 packages a day for 42 small and mid-sized companies. His clients include Gun Goddess, which sells gun accessories for women; Olively Soaps, which sells soap made from Turkish olive oil; and Walk on Socks, which started selling its eclectic socks through a Kickstarter campaign. "Most entrepreneurs have a core competency that is really strong, but they don't have any experience with packing or shipping logistics," said Randolph. The operation works like this: A small business ships its products to Lynx's warehouse in Olean, N.Y., Lynx inventories the products, unpacks them and stores them in a dedicated area. When a retail customer orders, say, a bar of soap from Olively's website, the order is electronically sent to Lynx. A Lynx employee gets the bar of soap and packs it for shipping -- which Lynx also charges for (the actual shipping costs are passed on to Olively). "If we do our job right, the person that receives the order will not know we were part of the process," said Randolph. The company's location means its shipments can get almost anywhere in the U.S. within two days. Pricing varies. For something like a DVD (which doesn't require much packaging and is easy to handle), Lynx charges around $2 to store and ship. A large set of dishes, on the other hand, can cost as much as $40 because it requires much more care. Not surprisingly, Lynx's profit margins are much higher on the smaller items that require less special attention. Business at Lynx has been growing. Randolph, 38, started the company in 2009 with $50,000 of his own money and $200,000 from two other investors. In 2011, he had three employees and did about $550,000 in sales. By 2013, he had 10 full-time employees, $1.2 million in sales and was turning a healthy profit. Randolph is no stranger to entrepreneurship: Previously, he ran a Hertz rental car location, headed up sales at a company selling menu covers and started two businesses of his own -- a children's clothing store and a company selling online bulletin boards to rural counties. Related: Is Perfect Bacon Bowl the next Snuggie? While both of those businesses failed, they provided valuable lessons and helped him to understand the challenges that entrepreneurs face. Because of that, he prides himself on offering flexible services and advice to the entrepreneurs who are his customers. The businesses don't have to sign long-term contracts, maintain a minimum amount of warehouse space, or have a set number of orders. By keeping his company focused on small firms, "we can grow with them and really anticipate their needs." he said. He also seems to thrive off working with start-ups. "I can be talking to a food entrepreneur about marketing, then pick up the phone and be talking to someone about garden fence production, and there's all this energy," he said. "It's the most exhilarating thing ever."